This week, I joined some of my colleagues at a Capitol press conference to help kickoff the Start Strong PA campaign. 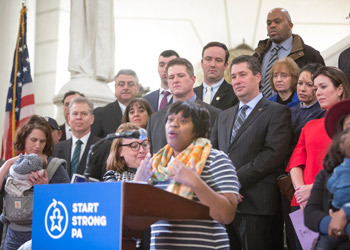 Through a statewide collaboration of partners, Start Strong PA aims to support healthy child development, working families and the economy by increasing access to affordable, high-quality child care programs for young children. You can watch the address on my website at RepONeal.com at 11:30 a.m. Legislation to amend the Pennsylvania Constitution to add a victims bill of rights was reintroduced this week in a step toward putting the question before voters.